Following the success of George Romero�s Night of the Living Dead, zombie movies were a dime-a-dozen during the 70s and 80s. This new horror subgenre became an international sensation, with Italian director Lucio Fulci and Spanish filmmaker Jorge Grau among those bringing the undead to their respective countries. One of Grau�s more famous works has suffered a bit of an identity crisis through the years, going from its original title, Don�t Open the Window, to Let Sleeping Corpses Lie, then Brunch with the Dead, and finally settling on The Living Dead at Manchester Morgue. Blue Underground now brings us the third DVD release of the film, keeping the Manchester Morgue title, and adding a second disc full of featurettes. George (Ray Lovelock) is on his way to an innocent job involving the restoration of a house in England, but when Edna (Christine Galbo) inadvertently knocks his motorcycle over, he�s forced to take her offer of a lift to his job. The catch is George has to stop to see Edna�s sister Katie (Jeannine Mestre) and her husband Martin (Jos� Lifante). When George stops for directions, he discovers the Department of Agriculture testing a new pest control system that drives insects crazy and makes them eat their own kind. This explains a man who wanders out of a cemetery, attacks Edna, and kills Martin. The police aren�t sure what to think, though, given that Edna and George are mysterious out-of-towners, Katie has a heroin problem, and the creep in the cemetery isn�t the only one seemingly hungry for human flesh. The film begins following a one-minute introduction by Grau, during which he discusses the movie�s numerous titles and how he hopes we have a �bad time� watching his film. Well, he doesn�t have to worry about that because there are far more �bad� things about the movie than good. For starters, these are pretty much the most inept zombies to ever grace such a film. Sure, most of your non-28 Days Later zombies are of the clunky, in-no-hurry-to-get-to-their-next-victim variety, but these guys had me checking my watch between every kill. Grau misses the boat as far as pacing goes also, as we�re almost an hour into the film before we get our first honest-to-goodness �zombie action.� There�s far too much slow, meandering exposition and pointless subplots for such a genre picture to be engaging. Here�s where things get tricky, though, since once we do get to some zombie munching, there�s gore, and plenty of it. From this point forward, the film transforms into a respectable, creepy NOTLD clone. The plot remains ridiculous throughout, but there are some genuine scares as the zombies meander through a hospital, and gore hounds will love the incredibly excessive entrail-eating. The flashes of brilliance include an interesting sequence in the middle of the movie involving a post-phone call conversation between our two protagonists. For some reason, Grau chooses to keep his camera inside the phone booth even after its glass door is closed and the pair converses outside the enclosed space. This results in their speech being slightly muted, and is purely intentional. Such an artistic touch is simply not seen in horror films, as the focus is usually centered on who dies next and when. While it�s nice to witness such an effort at art, it makes the overall experience more difficult to evaluate, as most of the intended audience simply wants to see the walking dead looking to satisfy their hunger for brains and intestines. Image Transfer Review: The film is presented in its original anamorphic 1.85:1 aspect ratio, and it looks pretty good considering the source material�s age and low budget nature. The images are generally sharp and detailed, but the color scheme is far from vibrant. Quite a bit of grain and dirt exist as well, but it�s never to the extent where the viewing experience is compromised. Audio Transfer Review: There are a few audio options, including the original mono track and a Dolby Digital 2.0 selection, but the best of the bunch is the 5.1 mix. The surrounds are very active, bringing the sound effects to surprising life. The dialogue is always crystal clear, blending in perfectly with the creepy ambient sounds and other audio elements. Extras Review: The extras are spread out over two discs, with the bulk of them on Disc 2. There are a few things to check out on Disc 1, though, including both an International Trailer and a U.S. Trailer, along with a TV Spot. Also here are a couple minutes of Radio Spots and a Poster & Still Gallery. Disc 2 has four featurettes, with some of the pieces approaching documentary status, at least as far as running time goes. Back to the Morgue is a nearly 45-minute tour of the movie�s locations in Dovedale, Derbyshire, which is given by the director himself, Jorge Grau. This is somewhat of a substitute for an audio commentary track, as the director takes us to these places while we watch associated clips from the film. Zombie Fighter is a 16-minute interview with star Ray Lovelock, who gives us some juicy tidbits about his memories from the shoot. Zombie Maker is 16 minutes of talk about special effects, as we sit down with special effects artist Giannetto De Rossi. Finally, there�s a 2000 interview with Grau that runs for 20 minutes and is an informative discussion that gives us even more insight into what went into making the movie. 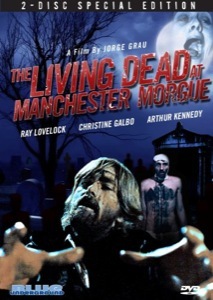 One of the oddest zombie films you�ll ever encounter, Jorge Grau�s The Living Dead at Manchester Morgue is a mixed bag. Blue Underground thinks highly enough of it to release this new 2-disc set, complete with excellent audio and video presentations, and some nice, new extra features.